This hashbrown casserole is cheesy, creamy, and dreamy!!! One of my lattest obsessions. We make this casserole for brunch, for all major Holidays or when we have company over for breakfast/brunch. Perfect Saturday morning casserole or a quick week night dinner. It takes about 15 minutes to do all the prep work and then it bakes for 45 minutes. Fast, easy, and delicious… just how I like it! 1) Do the prep work first. Shred the cheese into a big bowl. Then add the hash browns to the bowl. Finely dice the onion and add it to the bowl. Add the sour cream and cream of chicken soup to the bowl. Melt the stick of butter and add it to the bowl. Add the salt/pepper. Mix thoroughly with a big spoon. 2) Spray a baking dish with oil or butter spray. I use an 11X15 glass baking dish. Using a spoon, gently transfer the hashbrown mixture into the baking dish and smooth it out evenly using a spoon. 3) Cover with foil and bake at 350 Degrees for 45 minutes or until golden brown on top. If it is not golden brown after 45 minutes, take off the foil and bake on 400 for a few minutes until you get a perfectly golden (not burned) top! 4) Using a spatula cut into squares and scoop into plates. Best served piping hot! To reheat, bake in the oven for 10 to 15 minutes on 350 Degrees. 1) Wash tomatoes and add them to a big bowl. Drain out the water from the can of olives and add the olives to the tomatoes. 2) Shred the Mozzarella cheese. Add it to the bowl of tomatoes and black olives. 3) Add 6 TBS Real Mayonnaise to the bowl. Squeeze 1-2 garlic cloves into the bowl. Mix everything together with a spoon, gently not to crush the tomatoes or olives. Cover and set aside until ready to serve. 4) Transfer to a pretty bowl if eating as a side dish/salad or spread over fresh baked baguette Slices on a plate. Yum!!! 1) Do all the prep work first. Wash and cut all of your veggies into kebab sized chunks. 2) In a separate bowl mix the mayonnaise, barbecue sauce, and spices together until it it the consistency and look of a sauce. 3) Mix the veggies with the marinade sauce and let stand to marinate for at least 4 hours. I usually marinate the morning of the day we grill them. 4) 30 minutes before you grill, put the veggies on wooden skewer sticks. No particular order but I like to have a variety of all veggies on each stick for a pretty color combination and to get a taste of each veggie on each stick. 5) Grill the veggie skewers on the grill along with meat or steak or anything else you are grilling. They take about 30 minutes to grill to perfection. You can just lay them down on the grill, or get a grill basket and grill the veggie kebabs in the grill basket. I have tried both ways and both work just fine. 6) These are especially delicious with steak! Some call these empanada’s, some call these chebureki, either way these fried tortillas with a meat filling inside are a great appetizer and snack. Could also be eaten for dinner. I made a batch of these for a Super Bowl party this year and they were a big hit! These are convenient to bring to a get together/party, because they can be cooked in advance and you just pop them in the oven to preheat them. I do have another recipe for tortillas with meat filling on the blog, but this is my go to, easier version recipe. These are best served hot, and reheat very well in the oven. I actually like them best preheated in the oven on 300 degrees for about 10 mins as they get extra crispy this way! 1) Put ground chicken and ground beef in a big bowl. Puree 1 Onion in the food processor (or shred it using a shredder) and add to the bowl of ground meat. Add the spices and mix thoroughly. 2) Set up an empanada making station. I set up a big sheet of foil on the counter with the tortillas, the bowl of meat filling, and a small cup with water and a brush (to stick the tortillas together). 3) Lay each tortilla out and fill with meat mixture, one by one. I add about 2 TBS of meat filling to each tortilla. Brush the outline circle of the tortilla with water using the brush. Stick both sides of the tortilla together and seal tightly by pressing on ends with a fork. This also makes a nice rigid design. Set the done emanada’s aside. Set a pan with enough olive oil to cover the bottom of the pan, on Medium heat (I did 5.5) and let the oil heat up. 4) Once oil heats up and starts fizzing a bit, add 2 empanada’s at a time to the pan. Fry on each side until golden (about 3 Minutes per side). Have a tray lined with paper towels or napkins to put the fried empanada’s on so the extra oil would drain off. Serve hot. To reheat place in the oven for 10 minutes on 300 to 350 Degrees until hot and crispy! This is hands down, the best home made Mac & Cheese that I have ever tried. I came up with this recipe in an attempt to make yummy home made Mac & Cheese because it’s currently my 5 year old’s favorite food and I didn’t want to keep making it from the box. I made some last week when our friends were over for dinner and it was a big hit! I have never seen anyone eat as much Mac & Cheese as my friend’s husband did! That is the best compliment a chef can get, when all the food gets devoured! They said it was the cheesiest and best Mac & Cheese they have ever eaten. Not oily, and extra cheesy. 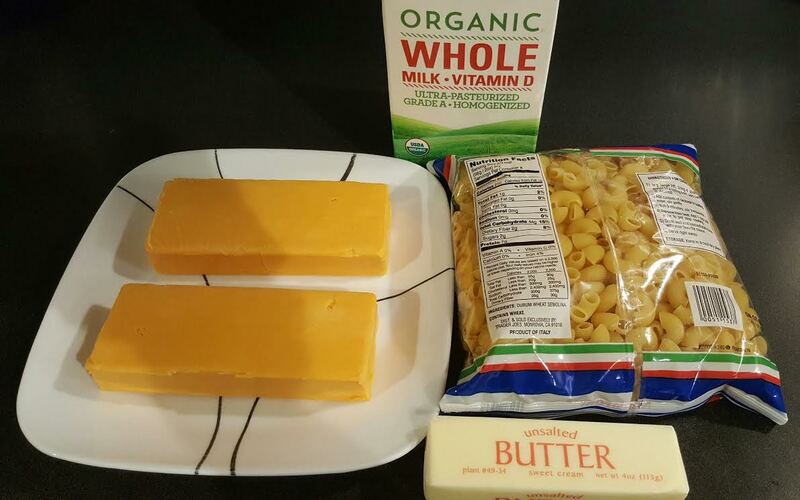 I wasn’t shy with the cheese that’s for sure and that is the secret behind this recipe, 2 blocks of a good sharp cheddar cheese, 1 small (4 oz) block Velveta cheese (optional) and a good brand of macaroni. This dish will be a big hit for sure and it’s so easy to make. I hope you love it, just as much as my family and friends do! I am posting now in time for Christmas, as it has been requested. I know this will definitely be a dish I have on all my Holiday tables from now on. 1) Cook the Elbows macaroni according to the package instructions. Make sure to add salt to the boiling water. 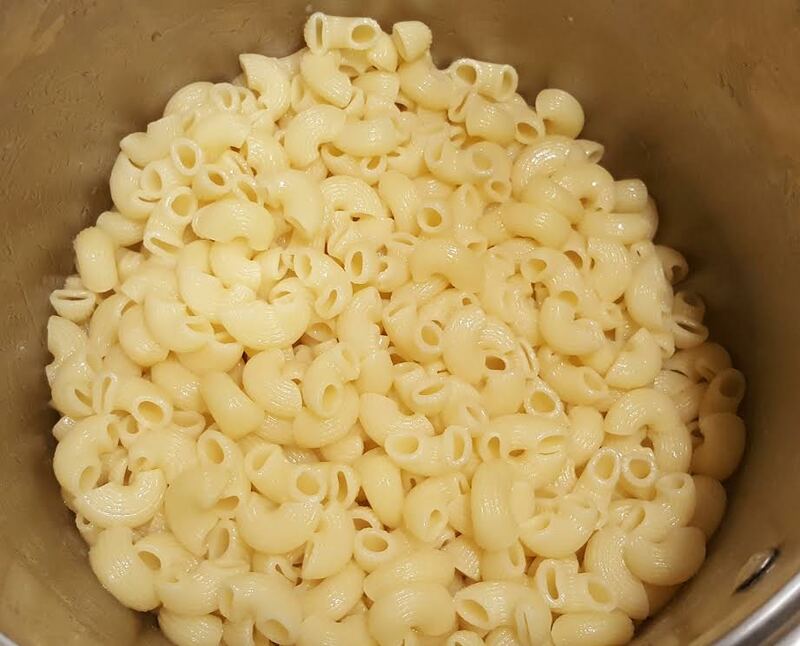 2) When Macaroni cooks through, drain out the water from pot, and add 4 TBS of butter to the macaroni. Mix well and set aside. 3) In a small saucepan, melt 4 TBS (1/2 stick) of butter on Medium heat (I did 6). Slowly add in 4 TBS of flour, and whisk together with the butter to make a thick sauce. When the flour is well incorporated into the butter and the thick sauce starts bubbling, add 1 Cup of milk. 4) When the Milk heats up, almost boiling but not yet, add 1 shredded block of sharp cheddar cheese a little bit at a time. Whisking to make a cheesy sauce consistency. If you are using Velveta cheese, add it to the pot of cheddar cheese now and incorporate into the cheesy mixture. Turn heat off. Mix the cheese sauce with a spoon. 5) Transfer the cooked macaroni into a casserole dish. Pour the cheese sauce all over the macaroni and gently mix. Sprinkle 1/2 block of shredded sharp cheddar cheese on top of the macaroni. Cover with foil. Bake on 350 Degrees for 15 minutes, right before serving. Optionally, you can transfer mac and cheese to a crock pot, mix, and keep on warm until ready to serve (and sprinkle more cheese on top when done). 6) Take Mac & Cheese out of the oven, remove foil, sprinkle the other 1/2 block of shredded sharp cheddar cheese all over top of macaroni and stick back in the oven (or add to crock pot) for a few mins to melt all over the top. Enjoy! Yum! Look at that cheesy goodness!!! These crock pot meatballs are a great appetizer. I am posting these just in time for Christmas! I got this recipe from my friend Kendra, who got the recipe from a friend. These are absolutely delicious yet the easiest thing you can make! Great for a party as they stay hot and easy to bring. I made these meatballs for a Christmas party we attended last weekend and they were a big hit! We took an empty crock pot home. Minimal work and only 4 ingredients. I plan on making another batch for a Christmas party next week! 1) Set your crock pot on the Low setting. Throw in the frozen meatballs. 2) In a big bowl, measure out and mix together the ketchup, grape jelly, and chili sauce. 3) Mix the sauces very well and pour into the crockpot over the meatballs and mix. 4) Cover the crock pot with lid and cook on Low setting for 4 hours. Mix about every hour. Serve hot in crock pot and keep on Auto or Low setting to keep meatballs warm. Enjoy! These mini baked appetizer sandwiches are loaded with cheese, and ham. These are quick and easy to make and one of the yummiest appetizers ever! I got the recipe from my friend Irina, when we were over their house for dinner and she made these. I couldn’t get enough! Of course I had to get the recipe to share with you guys! I wanted to post this recipe right on time before the Holidays, as we all need great appetizer recipes for entertaining. Enjoy! 1) Do the prep work first. Cut the tomato into little dice. Cut the Ham into little cubes. Shred the block of Mozzarella cheese. Finely chop 4 green onions (mostly green part). Using a butter knife, smear a little bit of Mayonnaise onto each piece of baguette bread. 2) Put everything on the baguette slices in this order; Ham, tomatoes, green onions, then squirt 2 small drops of ketchup on the baguette slices and cover with cheese on top. 3) Bake in the oven for 15 to 20 minutes, until golden to your desire! Best when served hot. This Shrimp Salad recipe was created by me but inspired by a salad I had at a restaurant called Canyon’s, in Blowing Rock, North Carolina. It was the perfect meal for me after a long, hot, exhausting day of exploring Tweetsie Railroad (a wild west theme park) in the beautiful mountains of Blowing Rock, North Carolina. I couldn’t stop thinking about it, so I had to recreate it at home and I did. The restaurant version was great but this home made recipe is even better, so much more flavor and you can add as much shrimp as you’d like. I love shrimp! And this shrimp salad takes it to a whole notha’ level (lol I know I’m corny). So fast and easy to prepare and definitely a summer favorite in our house now. I could literally eat this salad every single day! We ate it as a meal for dinner, but you could also make it as a side dish/salad. You can omit the shrimp if you are not a fan, and add anything else you want to it and get creative. Please don’t forget to share your idea’s with me, I would love to hear them! 1) Do the prep work first. Peel & devine the shrimp, rinse through with cold water and let dry. Wash all the veggies and chop everything up into one big bowl. I chopped the lettuce into small squares. The grape tomatoes in halves. The cucumber in fourths and then chopped into pieces. 2) Set a pan on Med-High heat (I did a 6) add some olive oil. When the oil heats up, add the shrimp. Add salt/pepper to shrimp and mix. When the shrimp looks done, lower the heat to low (I did 2) and add some Lawry’s Herb & Garlic marinade sauce, I added about 2 tablespoons and 2 pressed garlic cloves. Simmer with the lid on for a few minutes until shrimp is well cooked through. Turn off heat and keep shrimp hot. 3) When you are ready to eat, add the shrimp into the salad bowel. Mix gently. Each person can add dressing and croutons to salad individually to their liking. Enjoy! 1) Wash the Calamari (Squid). Preheat the oven to 200 degrees. Line 1 baking sheet with 2 layers of paper towels. Have a 2nd baking sheet ready nearby. 2) Pour enough oil to come 1 inch up the side of a large, heavy saucepan. Heat over High heat to 350 Degrees (On a deep frying thermometer). 3) Cut the Calamari bodies (Sacs/Tubes) crosswise into 1/2 inch-wide rings. Cut each cluster of tentacles in halves or thirds. Season the Calamari with salt/pepper and mix. 4) Pour the flour into a bowl. Divide the calamari into 2 batches. Put the first batch of calamari into the bowl with flour and coat it with the flour, shaking off excess flour. 5) Add the coated calamari into the saucepan with the hot oil. Cook over High heat until the calamari are golden brown, about 2-4 minutes. 6) Using a slotted spoon transfer the calamari onto the baking sheet lined with paper towels to briefly drain. 7) Move the calamari to the second baking sheet and place in the oven, to keep it warm and crisp. Repeat the same steps with the 2nd batch of calamari. Add more flour to the bowl if there is not enough, I did add a few spoons more of flour. 8) Transfer the calamari to the serving plate. You can add lemon wedges to the plate, for decoration. Serve with marinara sauce and or garlic aioli sauce for dipping, if desired. I served with both sauces because we like our calamari with yummy sauces. 1) Heat the oil in a medium saucepan over medium heat. Add the onion, and cook, stirring occasionally, until translucent, about 5 minutes. Add the scallions, anchovies (if using), garlic, and cook. Stir occasionally until garlic is fragrant for about 1 minute. 1) To make the roasted garlic, preheat a small conventional oven to 300 Degrees. Cut the top 1/2 inch from each garlic head to reveal the cloves. Discard the tops. Drizzle the extra virgin olive oil on the cut surfaces of the garlic heads, and sprinkle with a pinch each of salt/pepper. 2) Place the garlic heads, cut side up, in a small baking dish lined with foil. (I used the one that comes with the conventional oven.) Cover the baking dish tightly with aluminum foil. Bake 1.5 hours until the garlic is deep beige and very tender when squeezed. Set aside when ready. 3) Put the potatoes in a large saucepan. Add enough water to just cover the potatoes. Bring to a boil over high heat. Add salt to taste. Reduce the heat to medium low (I did 3.5) and simmer until the potatoes are tender, about 20-25 minutes. 4) When the potatoes are cooked through and tender, drain out all the water, and return the potatoes back into the pot. Mash the potatoes using a potato masher, or fork if you don’t have one. 5) In a small bowl, squeeze out the garlic cloves from the 2 heads of garlic . Mash the cloves with a fork. (They will be very tender.) Add the stick of butter and cream into the bowl. Mix very well using a fork and spoon. Until it becomes a creamy texture. 6) Add the roasted garlic, butter, and heavy cream mixture into the mashed potatoes. Mix very well. Mash potatoes again with the masher until they become as smooth as you prefer. Season with salt and pepper to taste. I did 1/2 teaspoon of salt. Transfer to a serving bowl or scoop into individual plates. Serve hot. *To reheat: Heat a skillet on medium heat with some butter, add the mashed potatoes. Mix until heated up. These reheat very well.